A group of work colleagues who work in jobs in the Marine Sector had the most amazing Marine eco-tourism adventure ….Cage diving and free diving with the iconic blue sharks that at this time of year migrate to UK’s habitat rich Cornwall with sea temperatures an impressive 18 degrees c .
As the group work in the marine sector… the marine environment is their passion and they chartered Chris Lowe aboard adventure Dive Catamaran “Atlantic Diver” from Newquay Sea safaris and Fishing to become one of the lucky few here to experience the slinky sharks known as “Wolves of the Sea” as they often hunt in packs and scavenge mammalian carcass as well as small fish, other sharks and cephalopods. The shark expedition left historical Newquay harbour but ventured far off shore away from swimmers and surfers where the pelagic ..ocean going sharks drift through and forage. forming Cornwall Marine Micro Plastics Researchers, undertaking the first UK #TRAWLSHARE project with 5Gyres, which aims to gather marine micro plastic samples from the seas surface along the North Cornwall coast to produce data on its presence and possible effects on the food chain ,of which the Blue Shark is top predator. It is believed toxins from plastic pollution in the body is concentrated at the top end of the food chain. It is National Marine Week 28th july-12th August and the spectacular blue shark encounter/sighting will be sent to the #NWDW2018 (National Whale and Dolphin Watch Week 28st July -8th August) sightings data base at the Sea Watch Foundation, alongside the 2 Harbour Porpoise that swam passed feeding at the same time as Atlantic Diver drifted through the chum slick and multiple sightings of common dolphins one of which was a calf with Foetal folds , crease lines across the body where the dolphin was folded in utero….A real treat for the shark tourists to see. Chris Lowe who also rescues Marine Life with British Divers Marine Life Rescue ( including a blue shark) earning him the nick name “Whale Rider” to the amusement of the group, has been offering these shark expedition trips for the past 10 years and is concerned over society’s increasing plastic use in everyday life. He hopes that helping to forge a caring attachment between humans and sea creatures through real life encounters ,done without causing disturbance ,will encourage people to really try to reduce their plastic use daily. He is a member of Richard Peirce’s Cornwall Cage Diving Operators Association which follows code of conduct for swimming with sharks to ensure good practise by experienced operators that shark tourist can look for when wanting to ensure sharks’ wellbeing. Surfers Against Sewerage campaign #plasticfreenewquay have some great ideas to help people along and are all working as a community towards plastic reduction use in Newquay. 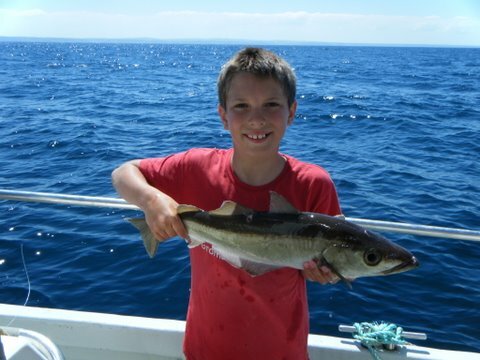 To book onto a shark experience contact Skipper Chris Lowe through www.newquayseasafarisandfishing.co.uk. Trips will be running through to October whilst the sea is still warm.